Laserliner SuperSquare Laser 2G Plus 90° green line laser ideal for laying wall and floor tiles. DLD Green laser technology produces high-quality bright green laser lines, clean, clear and easily visible line image. The 2 highly visible laser lines are ideally suited to floor alignment. Vertical & horizontal levelling on walls. Applied lay edges & contact surface make it easy to position floor tiles. Optimal alignment of areas which are difficult to access. Clean application on all surfaces, can also be attached with pins. Vials to adjust the device. 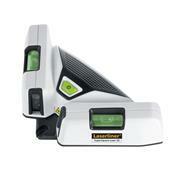 Can be used as a laser spirit level and allows for measurement of sloped planes. Requires 2 x 1.5v AA alkaline batteries. Includes harc case, laser enhancement glasses & attachment pins.